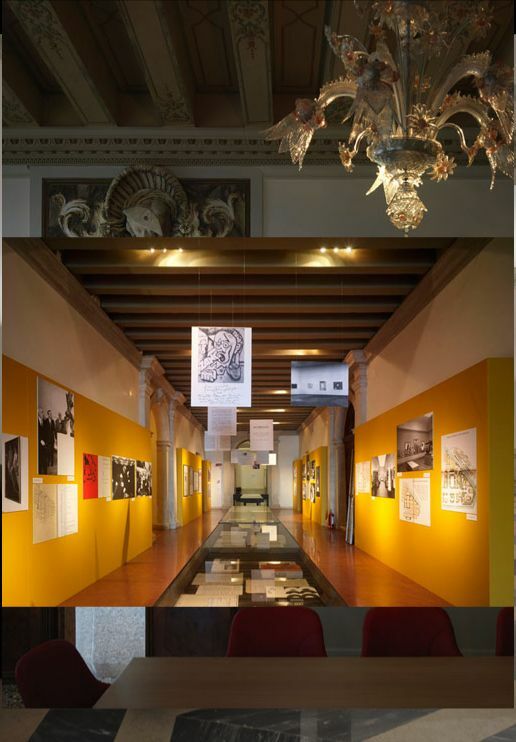 ca' giustinian (san marco, 1364/a) is the historical headquarters of the venice biennale and its offices. after careful renovation of the building, lasting for three years, ca 'giustinian is once again the venice biennale's registered office. the building, located a short distance from piazza san marco, offers space and services for the public with the potential to become 'home' to the venice biennale and a place for venetians to meet, a place to relate with the city and a magnet for meetings and events. today there are inside and outside areas that are freely accessible both to citizens and to visitors. on the ground floor, the ancient hall of mirrors with a view of st. mark's basin becomes l'ombra del leone, both a coffee shop and meeting place for the city, devoted to cultural initiatives, where artists and personalities can be invited to meet the public. here, mario nanni has designed an emotive and communicative lighting, a narrative wall lit with one of his poems of light, this time inspired by the lagoon shoals, by the land rising from and surrounded by the venetian lagoon, by views of the narrow streets, by the light of venetian grey and by the slow flux of a city tempo made up of footsteps and glances. 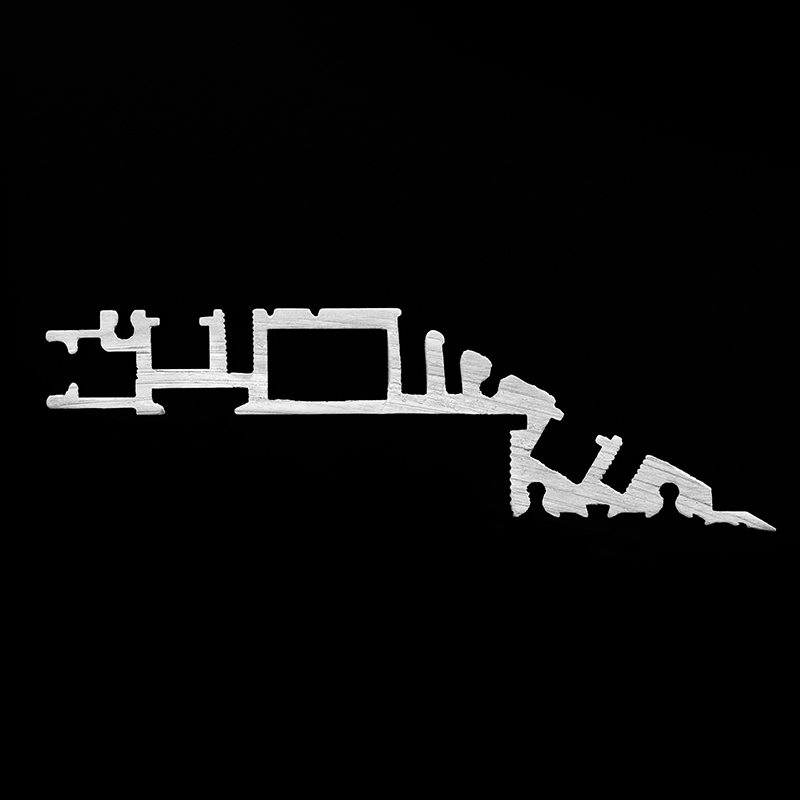 the rest of the building complex, on five levels, has been lit by Viabizzuno, with a design tailored to different environments because, just like a house, cà giustinian consists of several zones with different functions, and a variety of equipment for the operation of the whole establishment. the lighting is conceived on different occasions as a key to interpreting the space, to serve a specific function but as part of a single system. the lighting in ca' giustinian can be viewed as the guiding theme of the place, through the spaces and rhythms of its changing personality. very many areas were affected, from offices to service areas, from hallways to circulation areas, from display spaces to the presidential areas, from the coffee shop to the top floor terraces and from the footbridge over the water that marks the entrance from the grand canal to the exit routes. the complexity of the areas affected resulted in a multi-faceted design, with a wealth of architectural and lighting design features that had to take their cue from the numerous constraints imposed by this historic building. the lighting for the areas intended as offices had to take account firstly of requirements of an ergonomic nature, primarily with reference to the expectations of those using the working areas. then there were additional requirements relating to directions, signage, the appearance and enhancement of the specific work environment that was part of a complex with its own architectural and organisational image. 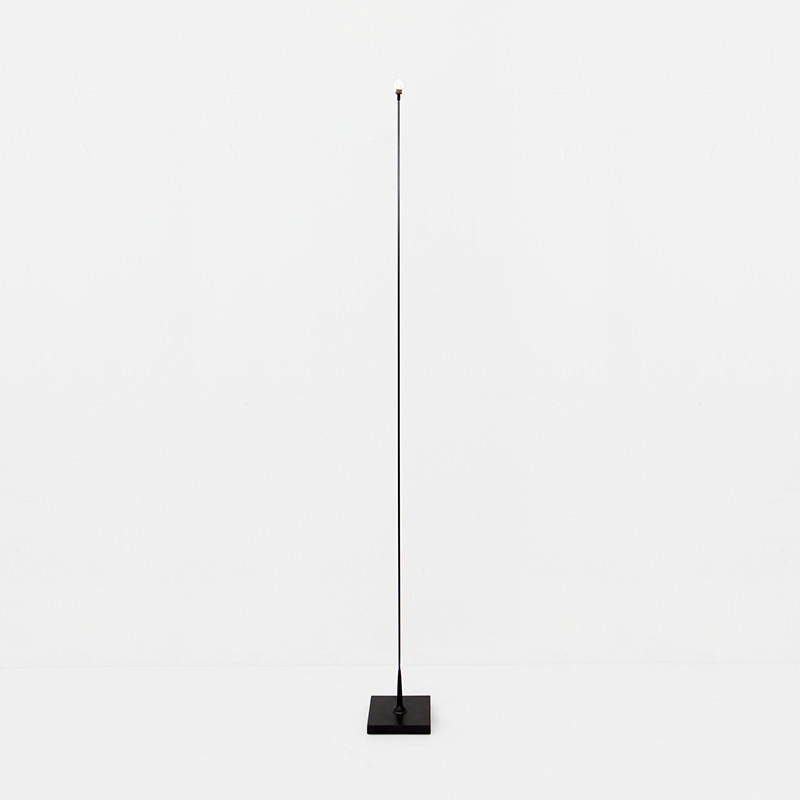 this is especially true for ca' giustinian, where the office areas within the biennale headquarters are of various types; reception areas, lobbies, waiting and reception rooms need welcoming lighting that helps to guide and inform the public, integrated as far as possible with the internal signage. in numerous locations within the building, intended as workspaces for tasks of an administrative or managerial nature where the use of monitors and other peripherals is anticipated, a high level of visual comfort is required with particular attention to luminance distribution and the control of glare. on the other hand, in working areas where the tasks performed entail contact with the public, public relations activities, meetings and other exchanges - rooms and areas used for meetings and equipped in various ways as required - it becomes important to combine visual performance and lighting flexibility to allow different activities to be carried on in the same space. in service areas such as stores and stockrooms, though, functional lighting is preferred, depending on the specific activity and the equipment used; in passageways, corridors and toilets, uniformly distributed light is needed. 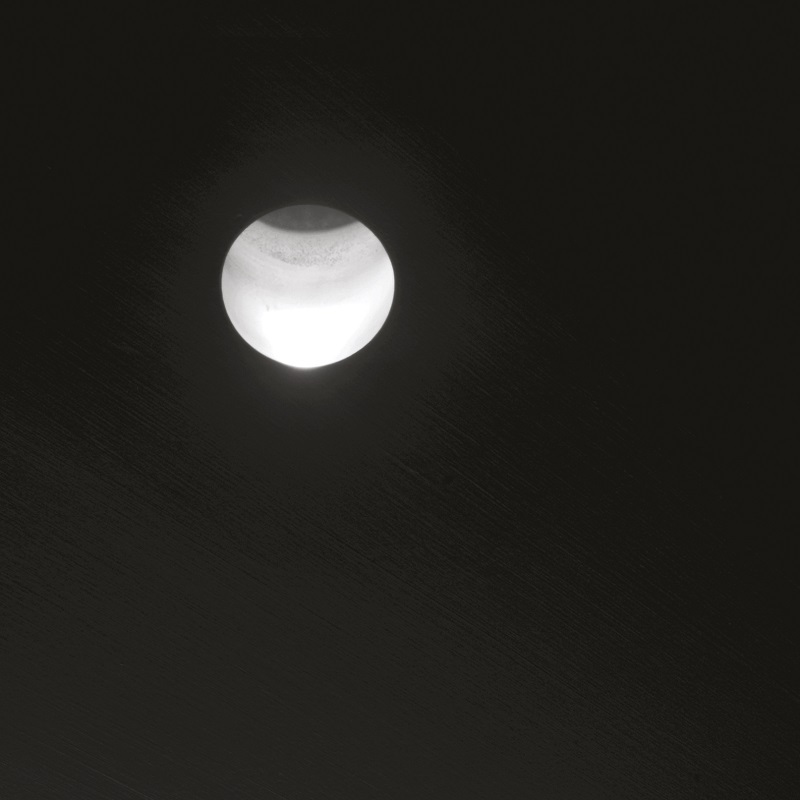 these considerations were the starting point in designing the lighting for cà giustinian. from the architectural point of view, as a building of great historical value rearranged to accommodate operational and managerial workplaces and a series of secondary activities related to public use, ca' giustinian consists of areas of very different character, as regards natural lighting, internal dimensions and room heights, distribution of furnishings and the intensity of use of each individual workplace. all these variables are combined with the need to develop a coherent and recognisable lighting system, which can improve the perception of space. the design for the offices combines the functional challenge created by various physical constraints with the aim of bringing all working and operational areas together, within a single coherent structure. for this reason, consideration was given to a special application of the c2 profile, a modular system in matt silver anodised extruded aluminium, which lends itself to being used both as a light fitting and as trunking for the cables, taking the light from the outlet provided to the ideal point for light distribution in the space, satisfying constantly changing internal distribution requirements. 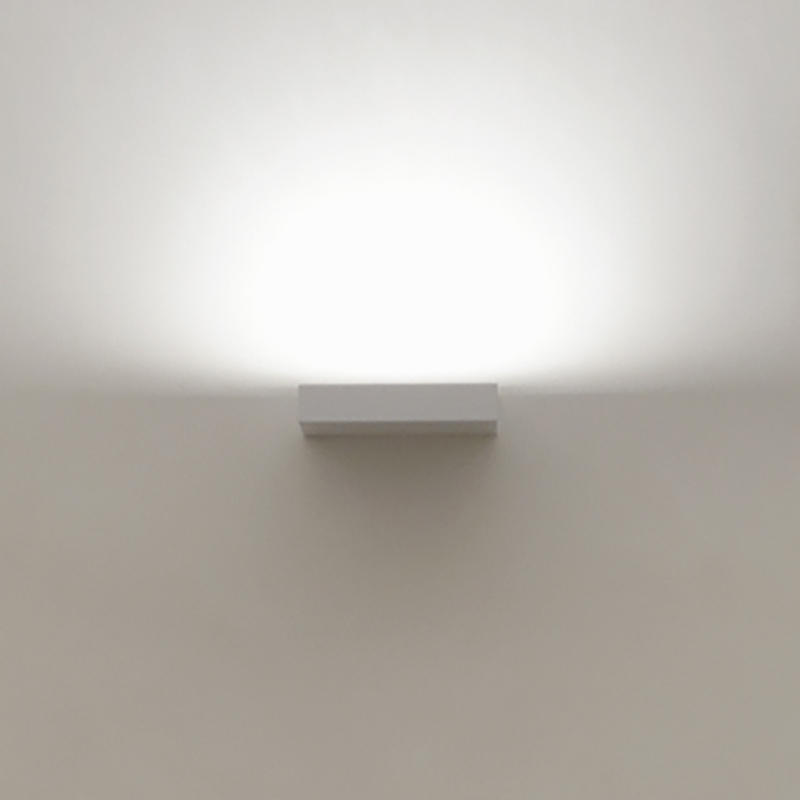 the c2 profile is wall and ceiling lighting combined, providing direct light and grazing light that, with what is perceived as a single system, provides direct light on desks, tables and shelves and indirect light to highlight the massing and architecture of the spaces. the light sources used are fluorescent, offering low consumption and quite a warm colour tone (2700° K); the opal diffuser improves light diffusion. depending on the size of room and number of workstations, each office is illuminated in a specific, individual way, thanks to a combined system of profiles, accessories and wiring that is repeated without ever being identical. each level of cà giustinian has a large central hall for circulation, the heart of the building, repeated for each situation on different floors. 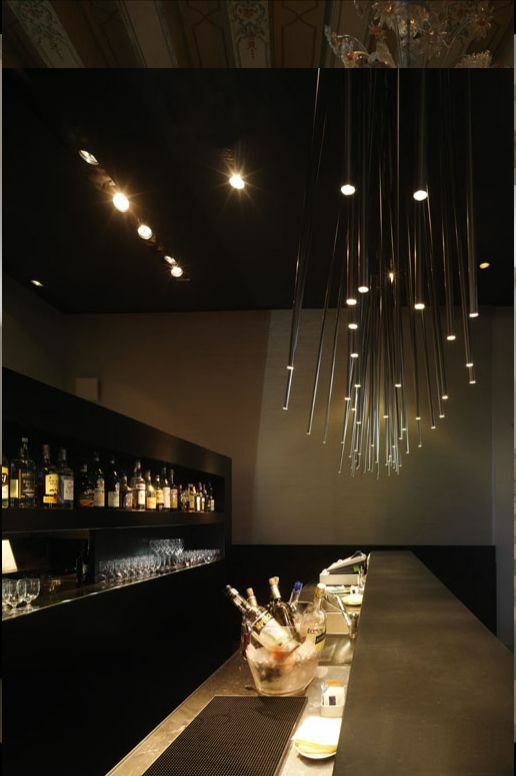 the lighting of this space is achieved with virtually wall-mounted fittings, in white painted metal; the light source is a 200W halogen bulb directed upwards, at an angle adjusted by means of a manual louvre and dimmable. 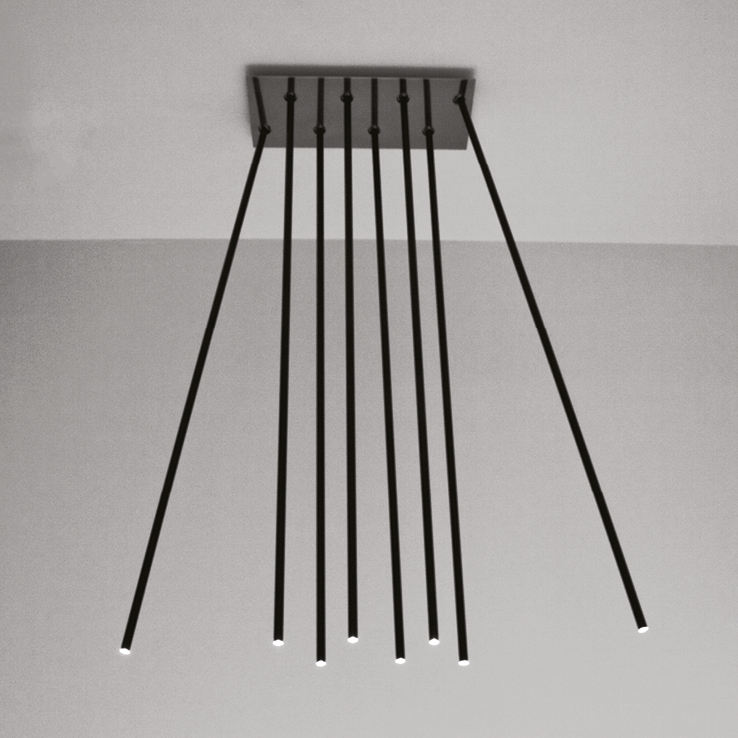 for illuminating corridors and circulation routes, service rooms and bathrooms, net light fittings are used, in net muro e net p. s. versions in polished stainless steel, wired for 3000°K fluorescent lamps. the length of the light fitting changes according to the size of the room to be lit, distributing diffused light and even creating accent lighting on the walls, to prompt people's eyes to new points of view. the terrace on the fifth floor and a smaller additional one at an upper level, are the building's extremely versatile areas of respite, available and equipped for meeting, reception, work and leisure opportunities. these two outside areas are places of great architectural and landscape value, given the privileged location with its view over the lagoon and its urban piazza-like character. 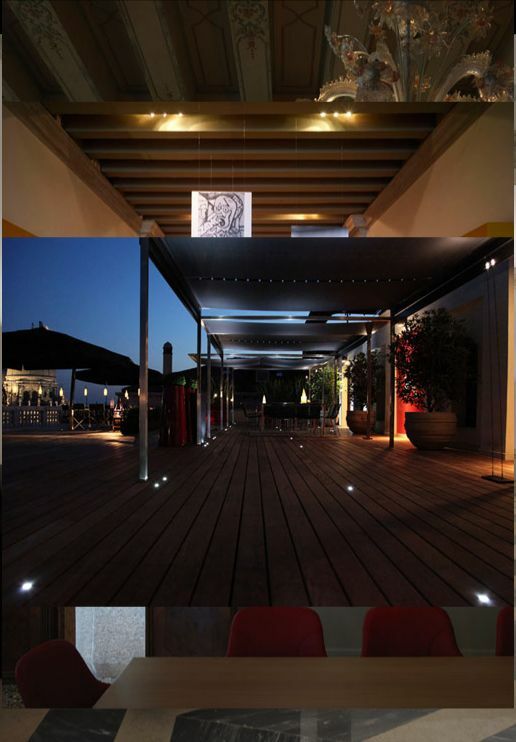 more than any other part of ca' giustinian, it is the terrace that exemplifies the need to combine functional lighting with a lighting effect in harmony with the magic and uniqueness of the place. the aim is to emphasise the atmosphere of the view over the grand canal, the bell-towers and roofs of venice, leaving the ‘talking' to the environment, already sparkling in its own light. so the terrace comes alive with small highlights, necessary for the comfort of those who occupy it, fully respecting the charm created by the context with its magical contrasts. 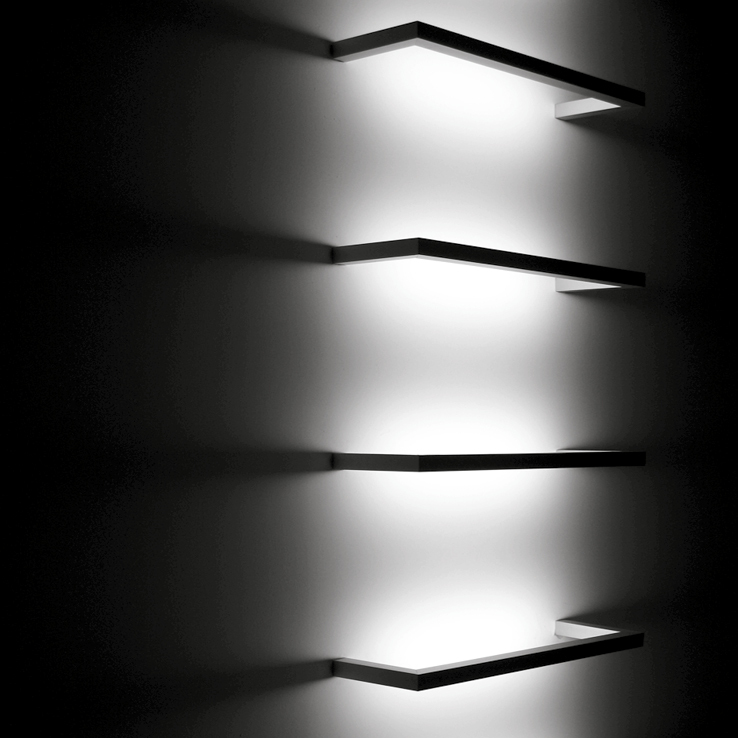 for this purpose, it is important that the lighting blends with the other elements without interference; the light source that best fulfils this condition is the led that, due to its small size, fits in with both fittings and furniture in a very versatile way. the leds in the small recessed zero spotlights that disappear into the wooden flooring of the terrace marking the route alongside tables and chairs; the leds fitted in the ombrellone luminoso (lighting umbrella), capable of spreading direct and indirect light, with colour effects and intensity controlled by remote control; the leds that illuminate the nautical map paper lanterns specially designed by mario nanni for this terrace: these are bell-towers of light. the lantern lights designed by mario nanni and made by Viabizzuno of synthetic nautical map paper on a chromed steel base and framework, are light fittings shaped like the bell-towers that can be admired from the terrace and the special treatment of the paper, shaped to match certain architectural details, establishes them as a striking design of solids and voids, highlighted by switching on the light inside. the beams of light project designs of the bell-tower façades onto the table tops. they were designed to be hung around the perimeter of the terrace and when suspended in the air, they sway to the rhythm of the wind and tides but they are also lanterns for strolling, an ideal light for the home, for entertaining. the guiding principle is the giovanni klaus koenig's philosophy about the typical light of venice 'the mezzo forte, which by contrast with piano becomes fortissimo'. the lighting is conceived on different occasions as a key to interpreting the space, to serve a specific function but as part of a single system. the lighting in ca' giustinian can be viewed as the guiding theme of the place, through the spaces and rhythms of its changing personality. very many areas were affected, from offices to service areas, from hallways to circulation areas, from display spaces to the presidential areas, from the coffee shop to the top floor terraces and from the footbridge over the water that marks the entrance from the grand canal to the exit routes. the complexity of the areas affected resulted in a multi-faceted design, with a wealth of architectural and lighting design features that had to take their cue from the numerous constraints imposed by this historic building. the lighting for the areas intended as offices had to take account firstly of requirements of an ergonomic nature, primarily with reference to the expectations of those using the working areas. then there were additional requirements relating to directions, signage, the appearance and enhancement of the specific work environment that was part of a complex with its own architectural and organisational image. this is especially true for ca' giustinian, where the office areas within the biennale headquarters are of various types; reception areas, lobbies, waiting and reception rooms need welcoming lighting that helps to guide and inform the public, integrated as far as possible with the internal signage. in numerous locations within the building, intended as workspaces for tasks of an administrative or managerial nature where the use of monitors and other peripherals is anticipated, a high level of visual comfort is required with particular attention to luminance distribution and the control of glare. on the other hand, in working areas where the tasks performed entail contact with the public, public relations activities, meetings and other exchanges - rooms and areas used for meetings and equipped in various ways as required - it becomes important to combine visual performance and lighting flexibility to allow different activities to be carried on in the same space. in service areas such as stores and stockrooms, though, functional lighting is preferred, depending on the specific activity and the equipment used; in passageways, corridors and toilets, uniformly distributed light is needed. 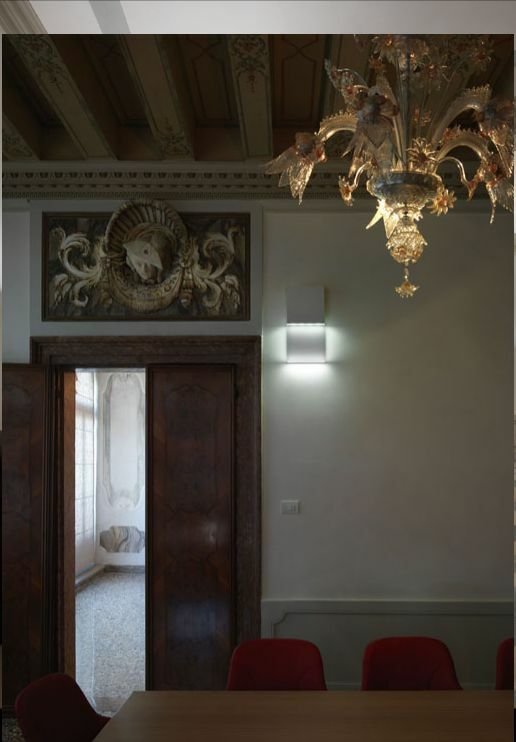 these considerations were the starting point in designing the lighting for cà giustinian. from the architectural point of view, as a building of great historical value rearranged to accommodate operational and managerial workplaces and a series of secondary activities related to public use, ca' giustinian consists of areas of very different character, as regards natural lighting, internal dimensions and room heights, distribution of furnishings and the intensity of use of each individual workplace. all these variables are combined with the need to develop a coherent and recognisable lighting system, which can improve the perception of space. the design for the offices combines the functional challenge created by various physical constraints with the aim of bringing all working and operational areas together, within a single coherent structure. for this reason, consideration was given to a special application of the c2 profile, a modular system in matt silver anodised extruded aluminium, which lends itself to being used both as a light fitting and as trunking for the cables, taking the light from the outlet provided to the ideal point for light distribution in the space, satisfying constantly changing internal distribution requirements. the c2 profile is wall and ceiling lighting combined, providing direct light and grazing light that, with what is perceived as a single system, provides direct light on desks, tables and shelves and indirect light to highlight the massing and architecture of the spaces. the light sources used are fluorescent, offering low consumption and quite a warm colour tone (2700° K); the opal diffuser improves light diffusion. depending on the size of room and number of workstations, each office is illuminated in a specific, individual way, thanks to a combined system of profiles, accessories and wiring that is repeated without ever being identical. each level of cà giustinian has a large central hall for circulation, the heart of the building, repeated for each situation on different floors. 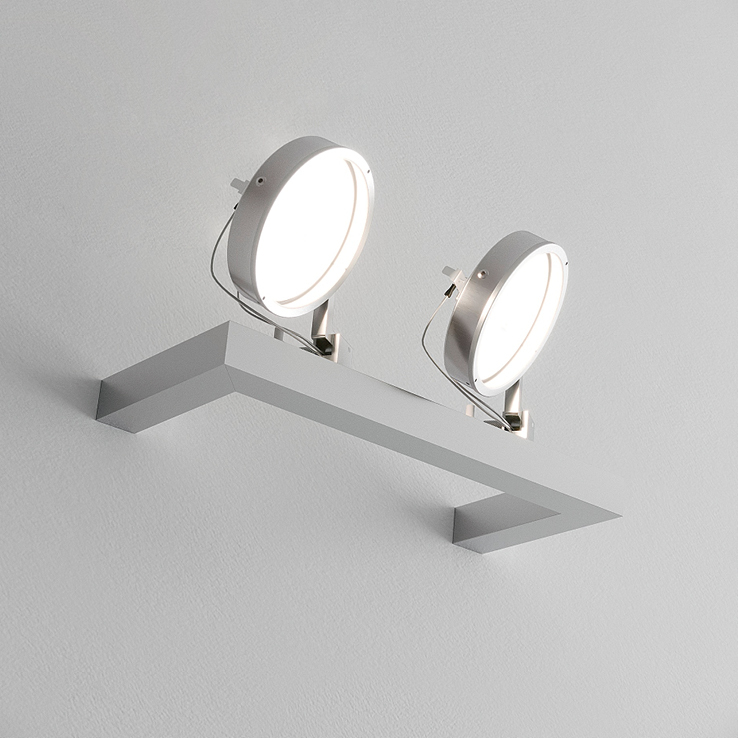 the lighting of this space is achieved with virtually wall-mounted fittings, in white painted metal; the light source is a 200W halogen bulb directed upwards, at an angle adjusted by means of a manual louvre and dimmable. 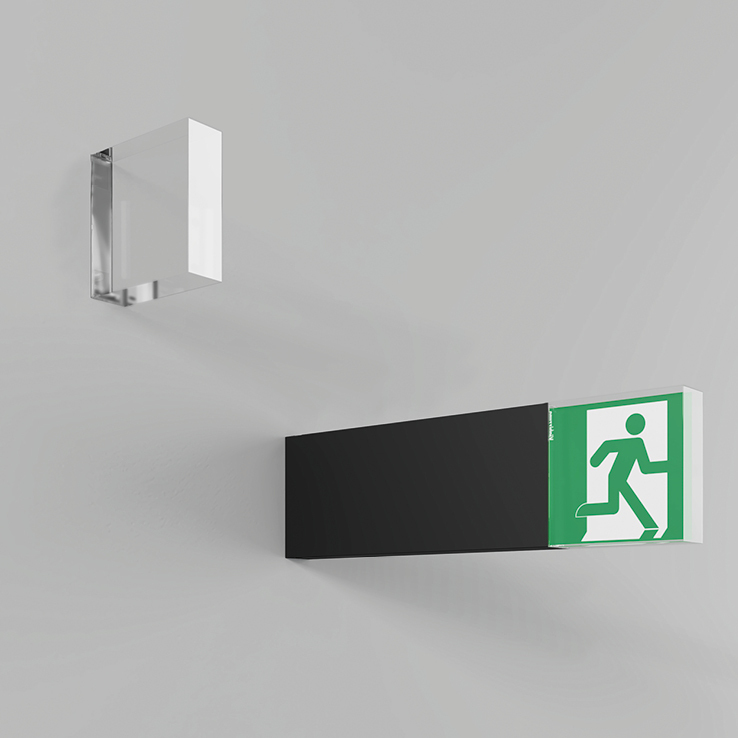 for illuminating corridors and circulation routes, service rooms and bathrooms, net light fittings are used, in net muro e net p. s. versions in polished stainless steel, wired for 3000°K fluorescent lamps. the length of the light fitting changes according to the size of the room to be lit, distributing diffused light and even creating accent lighting on the walls, to prompt people's eyes to new points of view. the terrace on the fifth floor and a smaller additional one at an upper level, are the building's extremely versatile areas of respite, available and equipped for meeting, reception, work and leisure opportunities. these two outside areas are places of great architectural and landscape value, given the privileged location with its view over the lagoon and its urban piazza-like character. 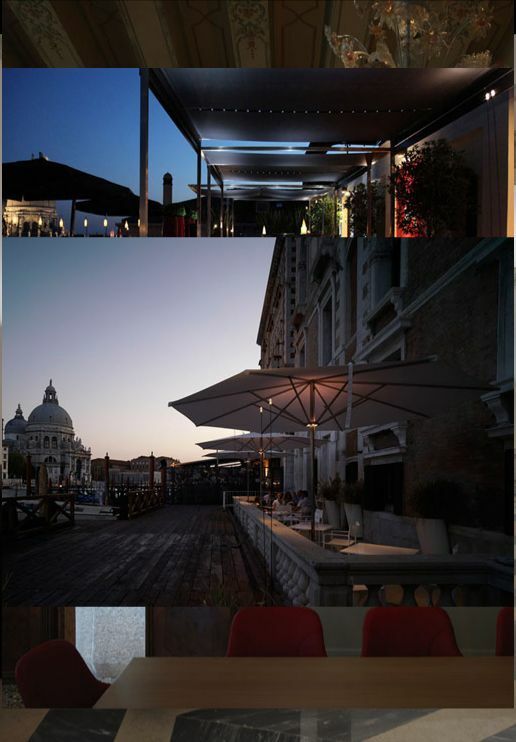 more than any other part of ca' giustinian, it is the terrace that exemplifies the need to combine functional lighting with a lighting effect in harmony with the magic and uniqueness of the place. the aim is to emphasise the atmosphere of the view over the grand canal, the bell-towers and roofs of venice, leaving the 'talking' to the environment, already sparkling in its own light. so the terrace comes alive with small highlights, necessary for the comfort of those who occupy it, fully respecting the charm created by the context with its magical contrasts. 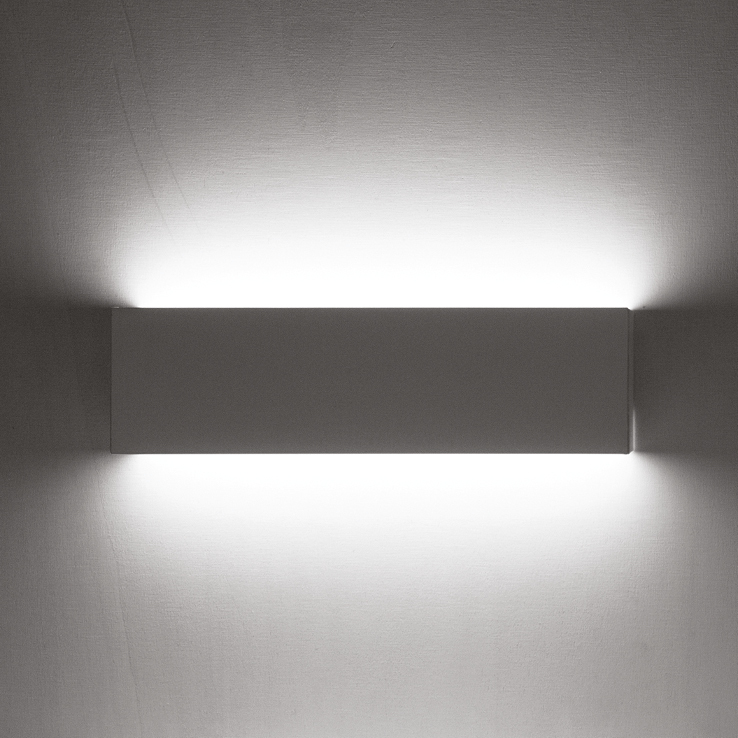 for this purpose, it is important that the lighting blends with the other elements without interference; the light source that best fulfils this condition is the led that, due to its small size, fits in with both fittings and furniture in a very versatile way. the leds in the small recessed zero spotlights that disappear into the wooden flooring of the terrace marking the route alongside tables and chairs; the leds fitted in the ombrellone luminoso (lighting umbrella), capable of spreading direct and indirect light, with colour effects and intensity controlled by remote control; the leds that illuminate the nautical map paper lanterns specially designed by mario nanni for this terrace: these are bell-towers of light. the lantern lights designed by mario nanni and made by Viabizzuno of synthetic nautical map paper on a chromed steel base and framework, are light fittings shaped like the bell-towers that can be admired from the terrace and the special treatment of the paper, shaped to match certain architectural details, establishes them as a striking design of solids and voids, highlighted by switching on the light inside. the beams of light project designs of the bell-tower façades onto the table tops. 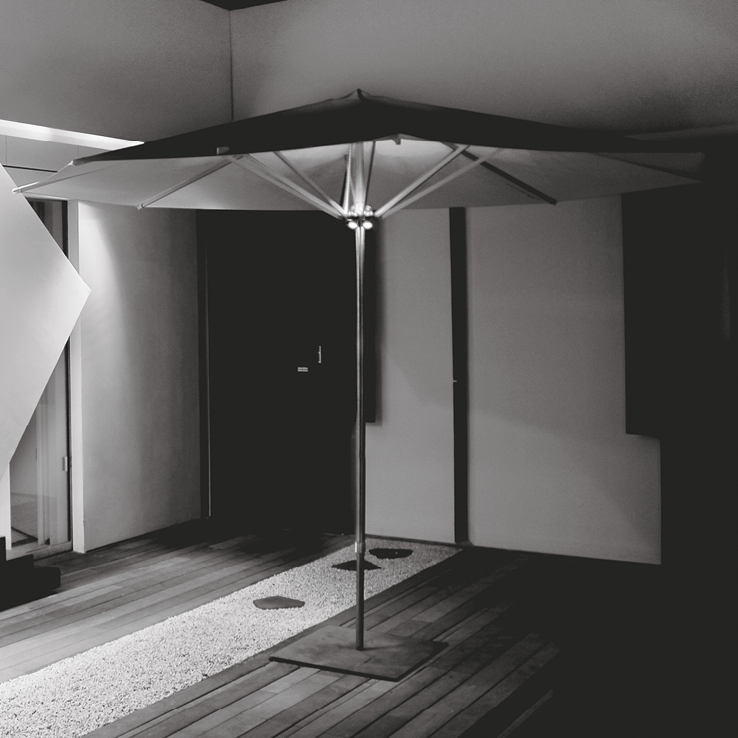 they were designed to be hung around the perimeter of the terrace and when suspended in the air, they sway to the rhythm of the wind and tides but they are also lanterns for strolling, an ideal light for the home, for entertaining. 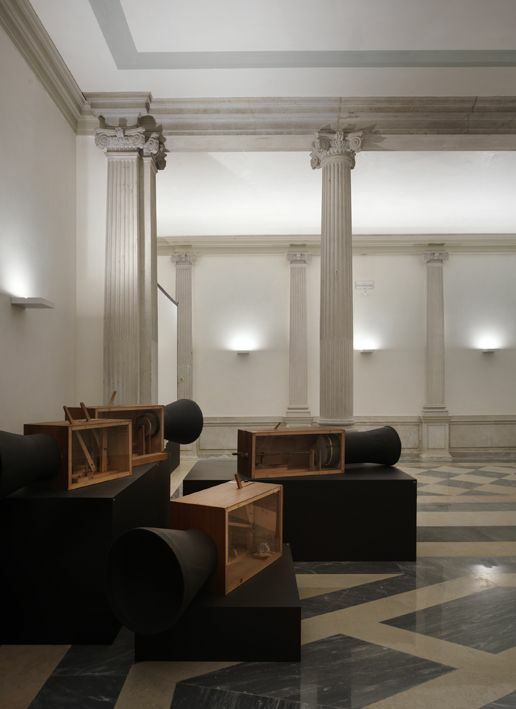 the guiding principle is the giovanni klaus koenig's philosophy about the typical light of venice 'the mezzo forte, which by contrast with piano becomes fortissimo'.